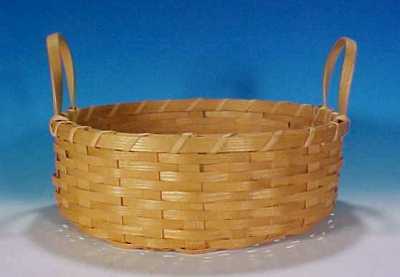 Vintage woven OAK SPLINT FRUIT BASKET with pop-up bottom base and spoke design. 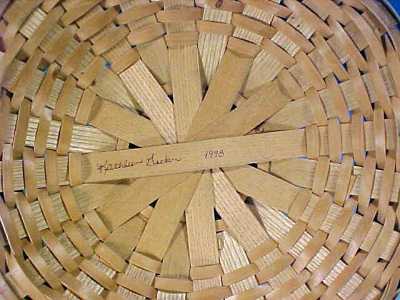 Signed on the bottom by the basketweaver Kathleen Becker and dated 1998. This vintage oak splint fruit basket features the pop-up base, also called a Johnny Jump Up, which keeps the fruit elevated off the bottom of the basket allowing fresh air to circulate, which in turn, keeps the fruit fresh longer! 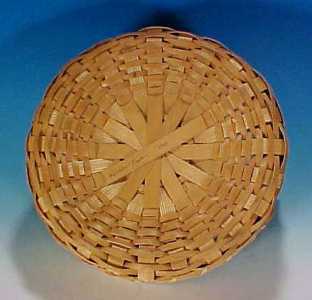 This woven fruit basket was hand crafted with oak splints and weavers and features oak wood side handles which have been woven down into the weaving along a stave. 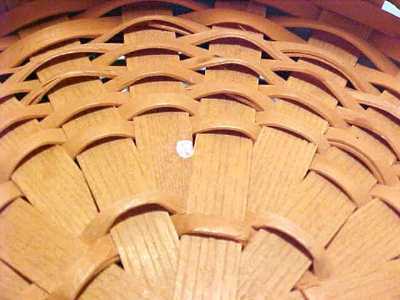 Used for display only, this woven fruit basket is in excellent condition with the exception of a tiny spot of white paint (see photo) on the inside of the basket. The materials used to weave this basket together with the craftsmanship will ensure that this basket will be around for many, many decades. All oak construction! This vintage oak splint fruit basket measures 11" in diameter, nearly 4" high to the rims and nearly 7" to the top of the oak wood handles. No damage to note, no odors and very clean and tight weaving. Natural finish - no stain or other finish applied. This vintage oak splint fruit basket will darken with exposure to sunlight, age and usage.